We’ve known for sometime that SMS is becoming passe for many smartphone owners worldwide. Sure, people still use it, but there are a slew of apps that go way beyond it, offering easy multimedia functions, group chats, video calls, gaming and much more. Beyond being SMS replacements, these apps are essentially ‘SMS+’ — to coin a phrase uttered to me recently by the founder of a messaging company. But with so many apps out there it can be difficult to know exactly which one is best for you and your friends. To help you make that choice, we’ve waded through the densely populated mass of chat apps to pick out the best. This page has now been paginated to make reading easier. You can view it as a single page here, if you prefer. WhatsApp needs little introduction since it is arguably the world’s most popular messaging app, with more than 300 million people using it each month. Simplicity is at the core of the service, to the point that even the least-tech-savvy of folks — such as mums, dads, grandmas and granddads — should be able to send text messages, photos and voice messages. The service costs $0.99 for a one-year subscription — although it is free for the first year — and it supports a wide range of phones. Pros: Simple to use and popular enough that most of your friends may have it installed already. Cons: While it isn’t expensive, it isn’t free, and it lacks the more sophisticated features which may appeal to some people. As the name suggests, GroupMe is dedicated to group messaging. Users can share text-based chats, photos, videos and more across the service, which is available on a range of mobile platforms and also for the desktop. 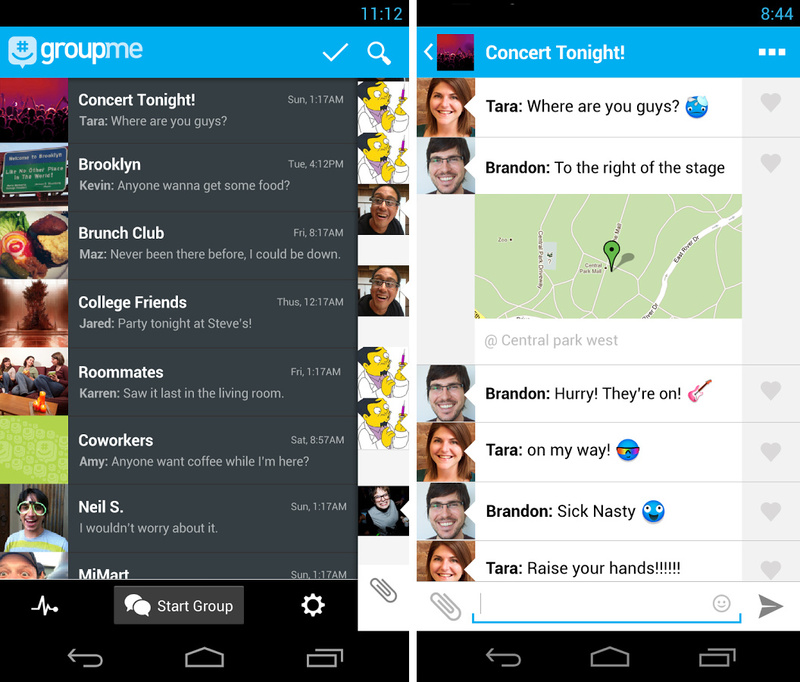 GroupMe — which is actually owned by Skype, another app on our list, keeps things simple. Like WhatsApp, everything is text-based, there are no voice/video calls, which makes it well-suited to techies and non-techies alike. Pros: Easy to use and available across a range of platforms, including the Web. Cons: There is no calling of any kind, and no content-related features. Verdict: A solid app for all, GroupMe is much like a real-time Facebook Group designed specifically for mobile. 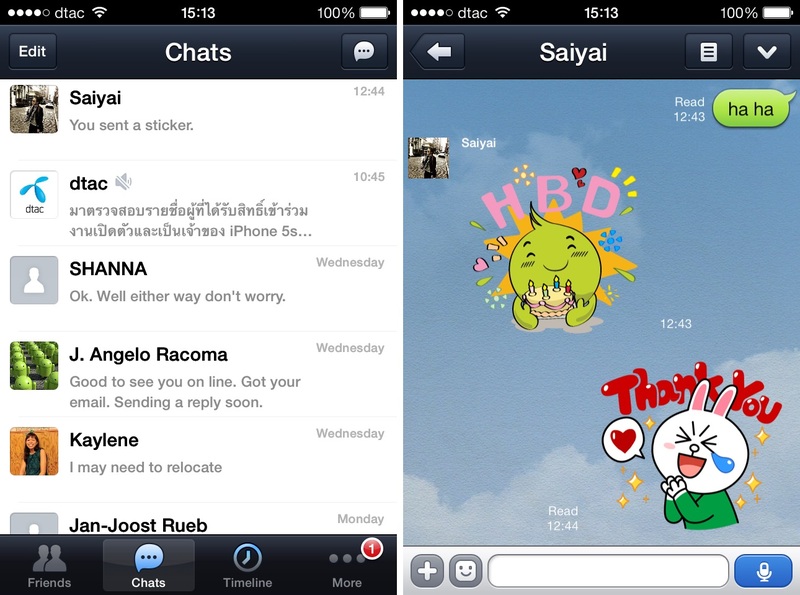 A messaging service born in Japan of a Korean Internet firm, Line offers a lot more than just the messaging basics. Users can send regular text messages, hold group chats, send photos/videos, make voice/video calls between fellow Line users and even play games with friends via the app. Line is available for free, but users can spend money on virtual content like stickers, in-app purchases within games and sign-up to get messages from their favorite brands. Line supports more than 40 apps — including a nifty camera app — and there are plans to introduce music and shopping services soon. Pros: Offers one of the most comprehensive selection of features, including video calls. Cons: With so many features, there is the potential for users to get a little lost within the service. Verdict: An excellent choice if you’re looking to do a lot more than merely replace SMS. This China-made service has been compared to Facebook, since, like Line, because of the way it mixes a range of social network-like features with messaging. WeChat signed up football Lionel Messi as it bids to become popular beyond simply China and Asia. WeChat includes ll the usual messaging features — multimedia/group chat/push-to-talk voice messages — alongside voice/video calls and opt-in accounts from brands, and some integrated services. 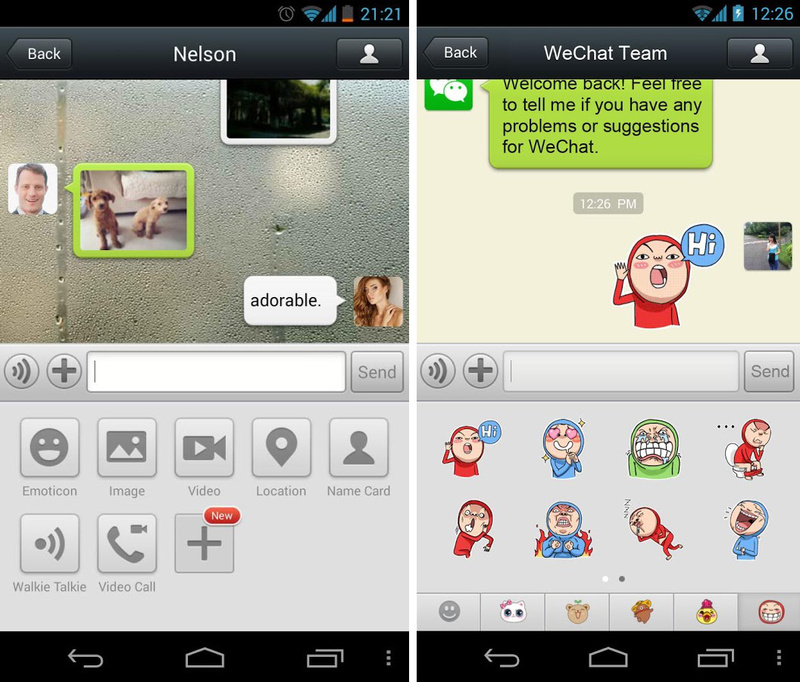 WeChat includes discovery features, which are becoming popular ways to meet new people (i.e. date), perhaps in a crowded bar. Pros: A tonne of features, and the app is beginning to integrate other services too. Cons: Some stigma and concerns from being a Chinese service, while it is not yet widely used in the West. Verdict: Another good option if you want more than just bare-bones messaging. Kakao Talk offers the best selection of games on a messaging app, in our opinion, and includes all the usual chat features — group chats/multimedia — and supports voice and video calling between users. There are also other Kakao apps and clients for the PC and Mac, while Kakao has an Android launcher that is only available in Korea at this moment. Pros: Excellent selection and games, and useful calling and messaging features. 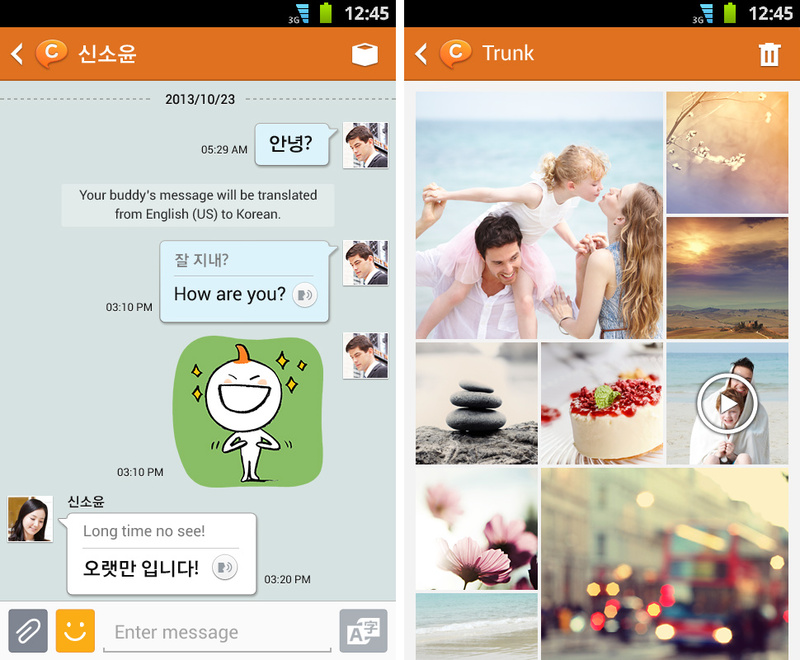 Verdict: An interesting service but, unless you’re in Korea or an avid messaging fan, you’re not likely to need it. A relatively new addition, having launched in early-2013, MessageMe is a slick (free) app that brings many of the features from Asian apps into a service designed to suit US consumer tastes. 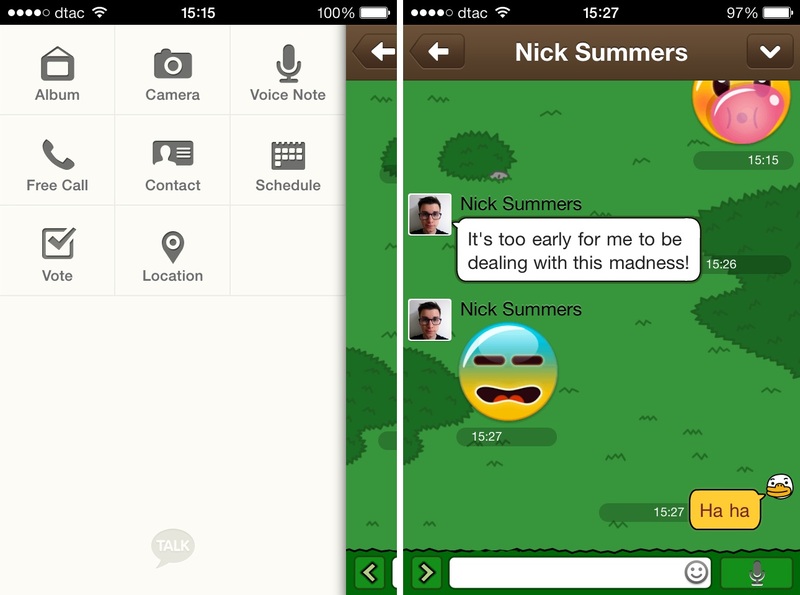 MessageMe users can send each other text messages, images, doodles (drawing made within the app) and videos. They can also share their location, music from their device and stickers — which are both free and paid-for. Update: The Android and iOS apps have not been updated since late 2013, which leads us to think that the service may be struggling, or preparing for a major revamp. Pros: Slick design which includes a range of features without bombarding users with options. Cons: Lacks voice/video calling options, which some people appreciate in a ‘messaging’ app. Verdict: Much like GroupMe, this is an interesting app that is providing most popular in the US, however it doesn’t have a massive user base. Kik is one of the few messaging apps that doesn’t require you to provide your phone number. Instead you simply pick a username, provide an email address and go from there. That easy sign-up process has made it popular across a range of devices — including iPods, tablets and other devices that don’t take SIM cards — and particularly popular among youngsters. Kik has a built in web-browser that lets you bring content to conversations, while it has a web-based platform which means a lot of websites behave like native apps when you visit them in the browser. Pros: Doesn’t require a phone number, is easily customized, and includes a very slick web browser. Cons: Has tended to be used by kids in North America so you may find that you don’t know a lot of people on the service. Verdict: One of our favorite apps thanks to the inbuilt browser. Tango burst on the scene as a mobile video chat app, and that experience remains central to the service today — although it also includes voice calls, games and a desktop client. 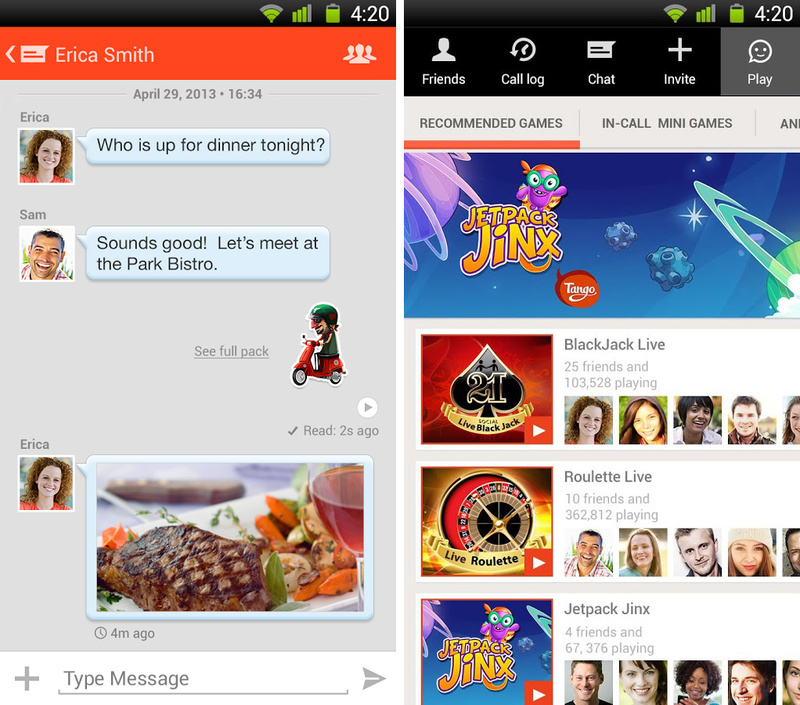 Much like many of the Asian services, two Tango users can play Tango games together via the app, assuming that they both download the game. That’s on top of regular text messaging, group chat, video, photo sharing, music sharing and more. Pros: Excellent quality video calling across a range of platforms. Cons: Tango is a more complicated service that WhatsApp and others, so it may not suit all users. Verdict: A good choice for video calling, Tango has just started getting into games and it already includes titles from top game makers. Taiwan-based Cubie is focused on drawing — users can make and send doodles to each other from inside the app — but it also includes a boat-load of other features. Aside from the basics, the service is very multimedia-centric. All conversations include a dedicated photo gallery for images from chats with each of your friends, and there is voice calls, voice messages, location-sharing, a YouTube widget, stickers and more. 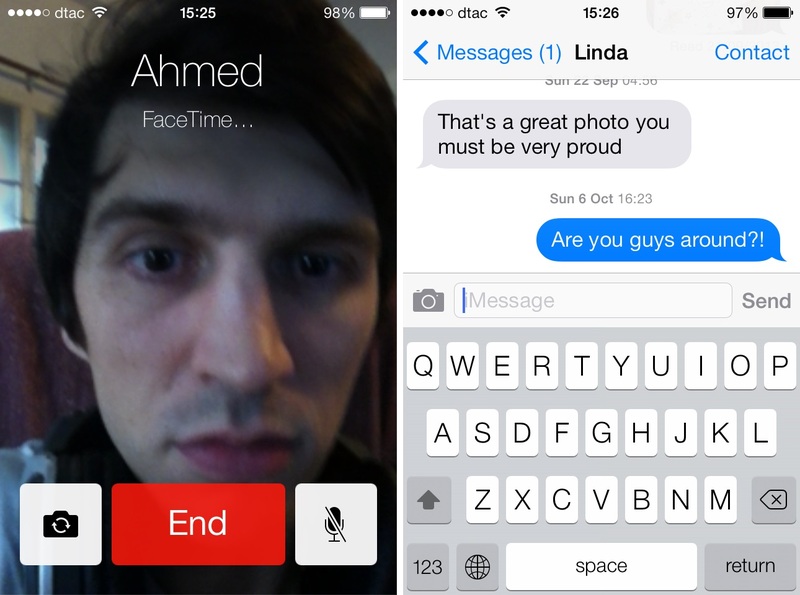 Pros: A very multimedia-focused app that can produce fun conversations between friends. Cons: Very Asia-focused, which may not be to the liking of all users. The app doesn’t feature video calls. Verdict: A unique messaging app that has proven popular in Asia, particularly among females. 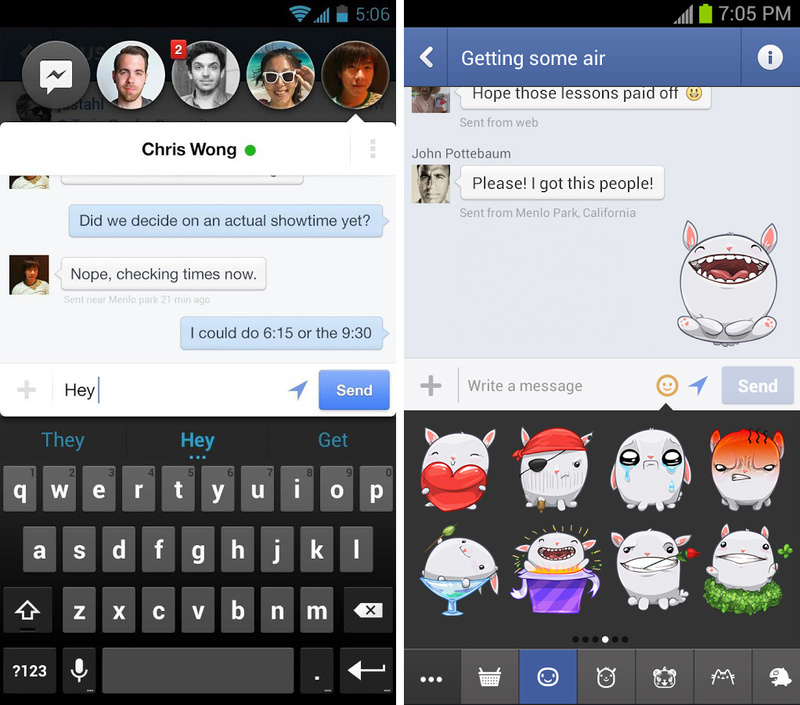 Facebook needs no introduction, its Messenger app is a standalone version of its Facebook Messaging service. Since Facebook is taking messaging out of its main app, you’ll need Messenger if you want to chat to people privately on your phone. 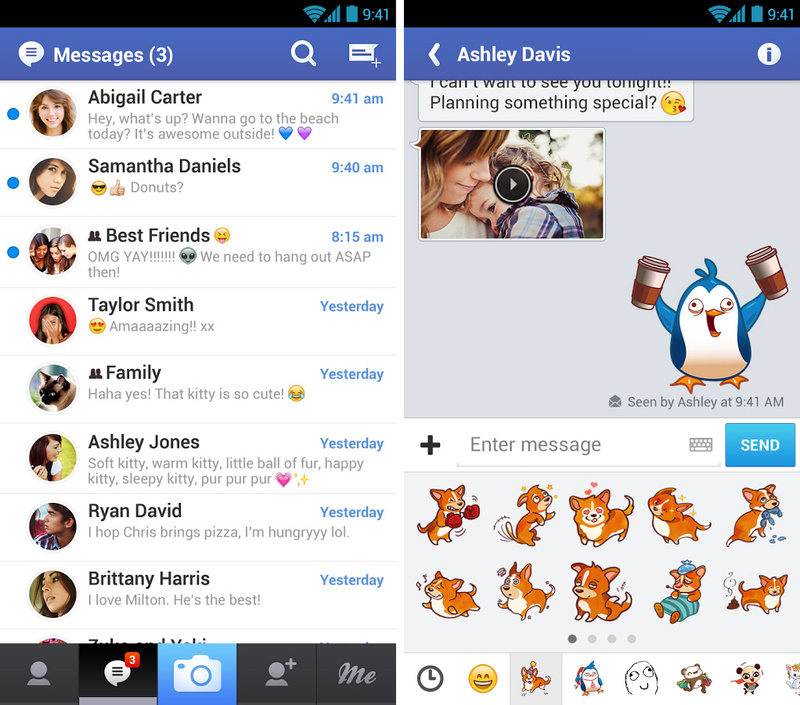 Messenger includes text chat, group chat, photo/video sharing, and even stickers. The chances are almost all of our friends are on Facebook, and, even if they don’t have the Messenger app, your messages will be sent to them as Facebook Messages. Pros: Everyone uses Facebook so there’s no question of having to convince friends to download the app. Cons: Lacking video calls and gaming, but, moreover, it doesn’t feel like a unique chat app. Hike is a messaging focused app which allows users to share text messages, photos, videos, short voice messaging and chat in groups. It also includes a rather nifty ‘SMS out’ feature, and lets you lock conversations with a passcode. Currently available in Hike’s native India only, SMS-out lets users send chat messages to non-Hike users — useful in group chats. The app also includes stickers and location-sharing, while it is available in a range of European languages. Pros: Neatly designed with a range of messaging features. Cons: SMS-out feature is India-only, and there are no calling features in the app. Verdict: Useful app for those based in India, but its reach in Europe is growing as it becomes a feature-rich secondary option to other services. 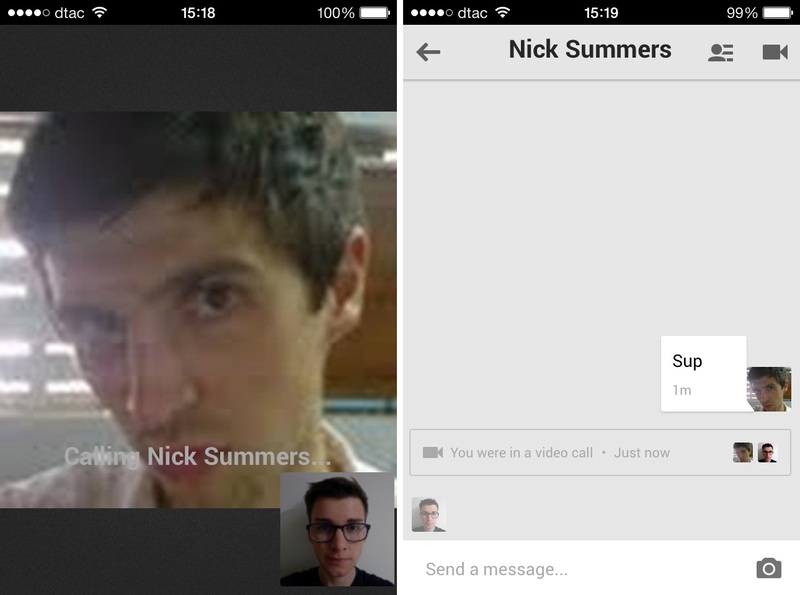 Hangouts are multi-person group video chats that initially began on Google+. They are quite unlike other video chat services, because they allow multiple users on the same call for free. The text-based message service is basic, and essentially replaces Google Talk. Pros: Available on numerous platforms. 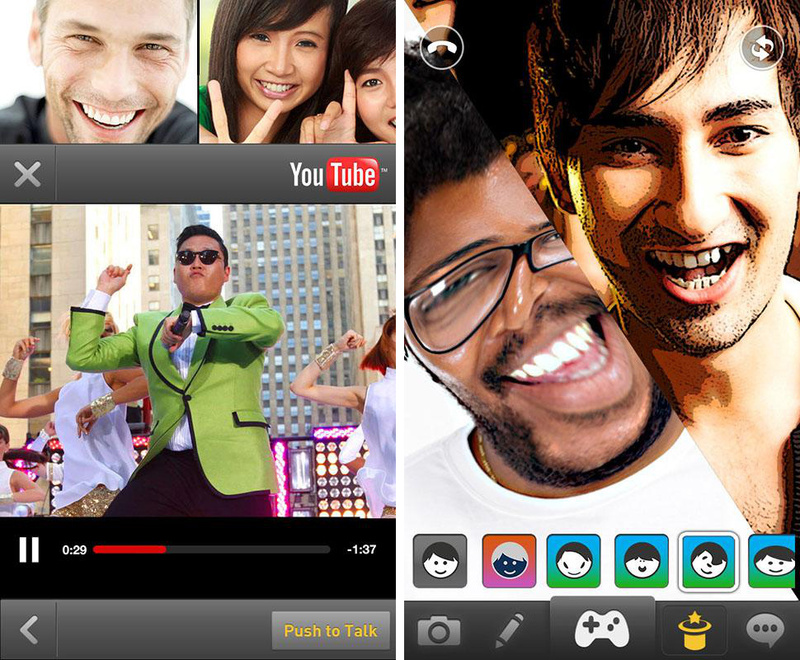 Multi-person video chat is free. Cons: No support for SMS (yet) and text chat is basic. Verdict: A really useful app for keeping in touch with friends, family and colleagues, which compliments other messaging-focused apps. Maaii is a Skype-meets-mobile-chat app that lets users place calls to regular telephones, as well enjoy free calls to fellow Maaii users. You can buy credit or earn it by completing tasks within the app. The company is unsurprisingly run by ex-Skype employees, but it takes a mobile-first approach to messaging. 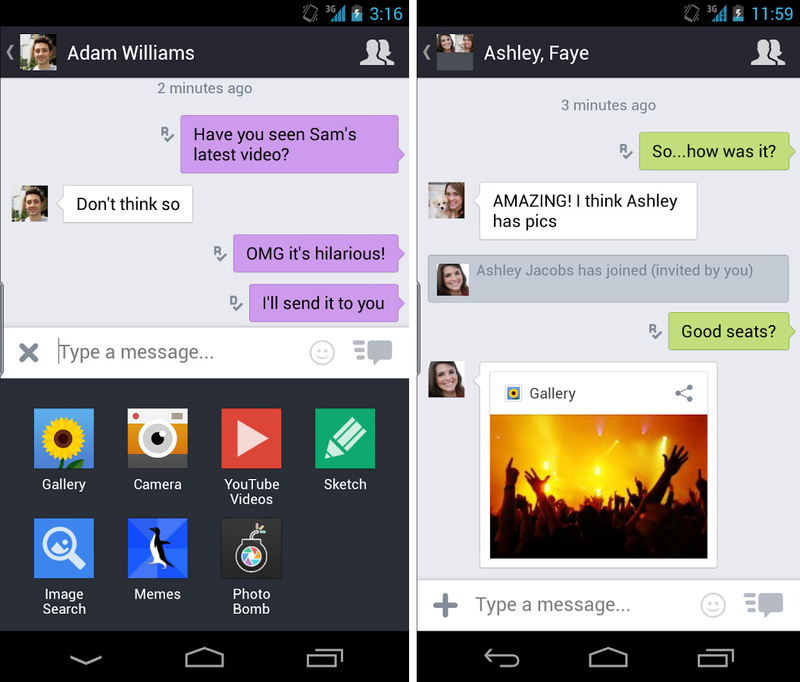 The app also offers group messages, multimedia sharing, stickers and more. Pros: Excellent quality and priced international calling bundle on a messaging app. Cons: Its features makes it more complicated than other apps. Verdict: An interesting option for making international calls. Strictly not a complete app, Apple’s iMessage and FaceTime services are included here as one because they compete with the other apps listed and are used by more than 250 million users — who send some 2 billion messages per day. The apps are only for Apple devices: iMessage replaces SMS and sends messages and multimedia between two users via an Internet connection, which makes it free. FaceTime allows one-on-one video calling, much like Skype, and it now features voice calls for those with iOS 7. Pros: Both apps are easy to use. iMessage in particularly automatically overrides regular SMS when sender and recipient are both iOS users and both online. Cons: Both services are limited to iOS and Mac users, and they offer more basic features than dedicated messaging apps. Overview: Two incredibly useful services for Apple customers. BlackBerry Messenger (BBM) is the original mobile messaging app, and it remains a core feature for owners of BlackBerry’s increasingly marginalized smartphones. It was finally made available for iOS and Android in 2013, and is also available on Windows Phone. The apps include content-specific channels, voice/video calling and more, but the app has been so late to go cross-platform. Pros: Includes a range of features and has BlackBerry’s strong security behind it. Cons: Most people have already moved on to other messaging apps. Verdict: Could have been a game-changer a few years ago. Rounds is a video-calling focused app, that lets Android and iOS users connect with real-time broadcasts. Rounds isn’t just about video, it’s really focused on allowing activities between two people — and that extends to playing games, watching YouTube videos, and sending text messages while on a voice/video call or within the app. There are also playful affects and other features to add something a bit different to the experience. Pros: A wide range of activities to complement video calls, making it a fun alternative for those that regularly connect with friends and family that way. Cons: Audio messages are not supported and some of the features may seem a little whimsical for many. Verdict: An interesting alternative to Skype for video chats. 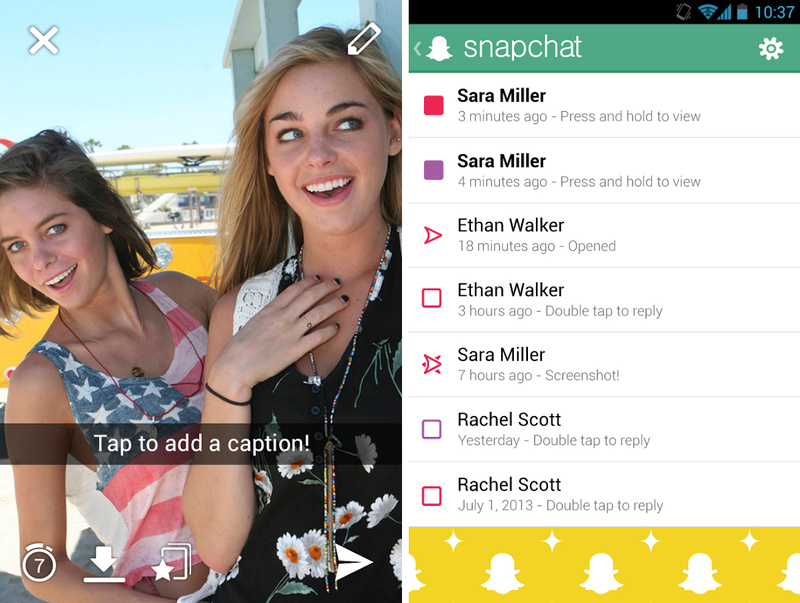 Is Snapchat a messaging app or a social network? It got Facebook worried enough to release a clone that is now near-forgotten, but either way it’s become a popular way to communicate for some so it makes our list. Quick introduction for those who (somehow) don’t know of it: Snapchat is a chat app that lets users share photos which expire within 10 seconds or less. It recently unveiled ‘Stories’, a social network-like feature that allows users to share photos of their day without them expiring. Pros: Enjoys impressive reach in the US where it is hugely popular among youngsters. Cons: The concept of expiring images doesn’t resonate with some people, and the app is fairly complicated for new users. Verdict: A real hit and miss app, with a limited numbers of users outside North America. Skype is a household name for many but its service has suffered to a point on mobile because it was designed for desktop computing. As is the case with its PC and Mac apps, the mobile service lets users make free video and voice calls, and exchange text messages. Skype is notorious for not syncing mobile and desktop apps, but a new version of the service improved some of the issues significantly. Pros: Good quality video calls and a strong desktop client. Cons: Mobile apps feel clunky and heavy when compared to mobile-first rivals. Verdict: Skype has become one of the world’s most visible messaging and calling services — that alone makes it an important mobile app. 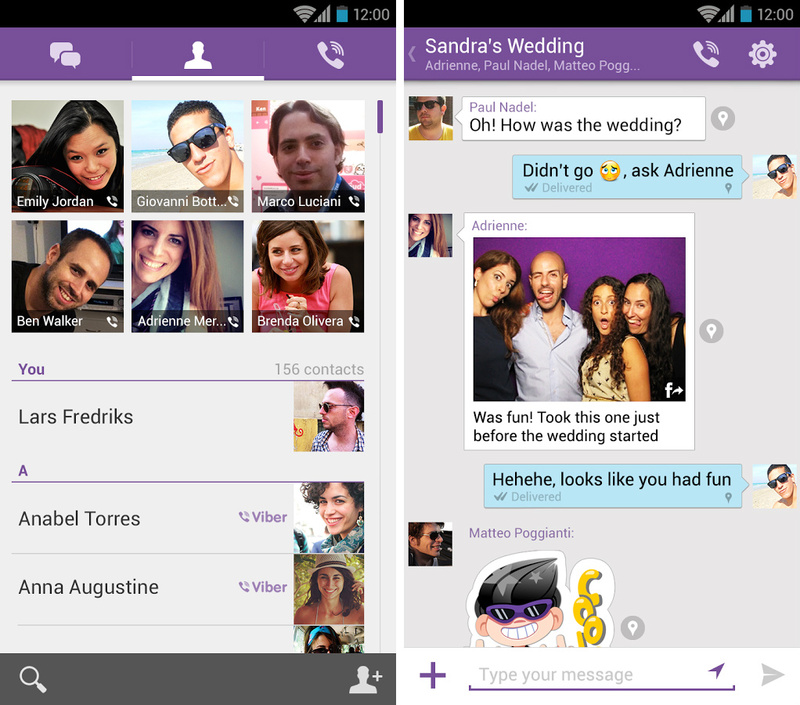 Viber is a popular app for making video calls on your smartphone. 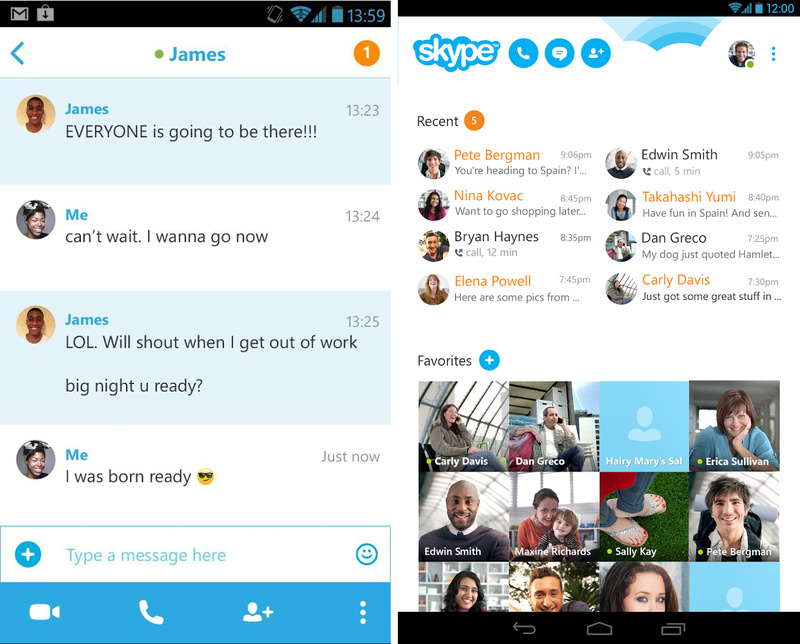 Unlike Skype it was built to be on mobile first, and it only introduced a desktop client recently. In addition to video and voice calls, Viber offers text chat that includes the very Asia concept of stickers. The app was bought by Japanese e-commerce giant Rakuten in early 2014, and there are plans to add gaming and shopping features in the future. Cons: It’s text-based messages features are comparatively less developed than others. Verdict: An excellent mobile app for making calls. India-based messaging app Nimbuzz brings the full package: video/voice calling, file sharing, chat messaging, games and support for a range of platforms. 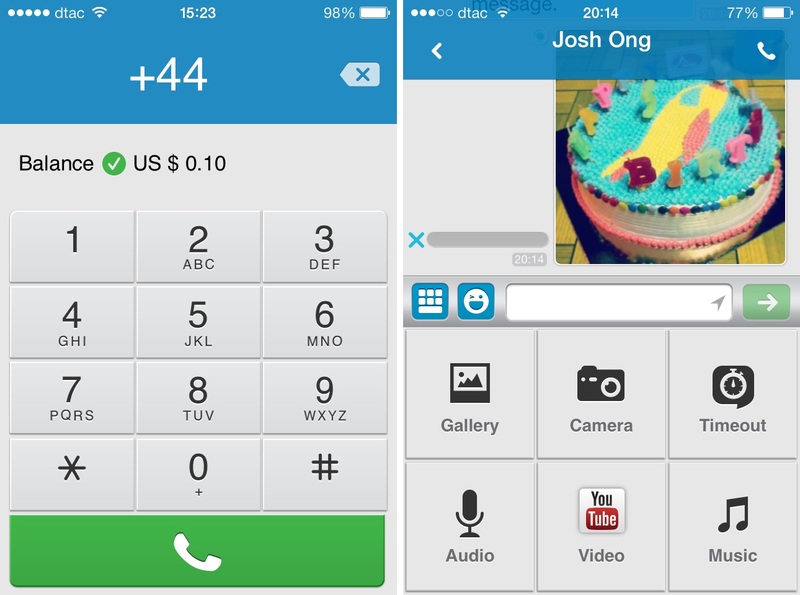 Users can also purchase Nimbuzz Out credits to use for calling landlines and mobile numbers. Pros: Available on a range of platforms. Cons: Relatively plain text chat rooms – no stickers. Verdict: A good app for heavy users of audio calls. 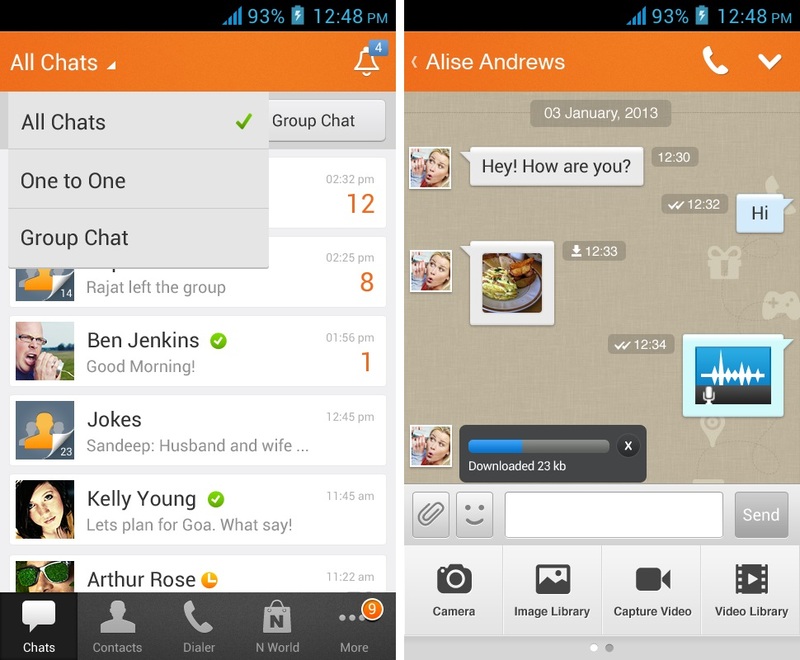 ChatON is a messenger app created by Samsung but it is not just limited to the company phones, and is it is available for most platforms. One interesting feature is its translation service in 1:1 chat rooms. Cross translation are available for 4 languages: Korean, English, Chinese and Japanese. French, German, Italian, Portugal and French messages can be translated into English and vice versa. Pros: It’s a messaging app… with some features. 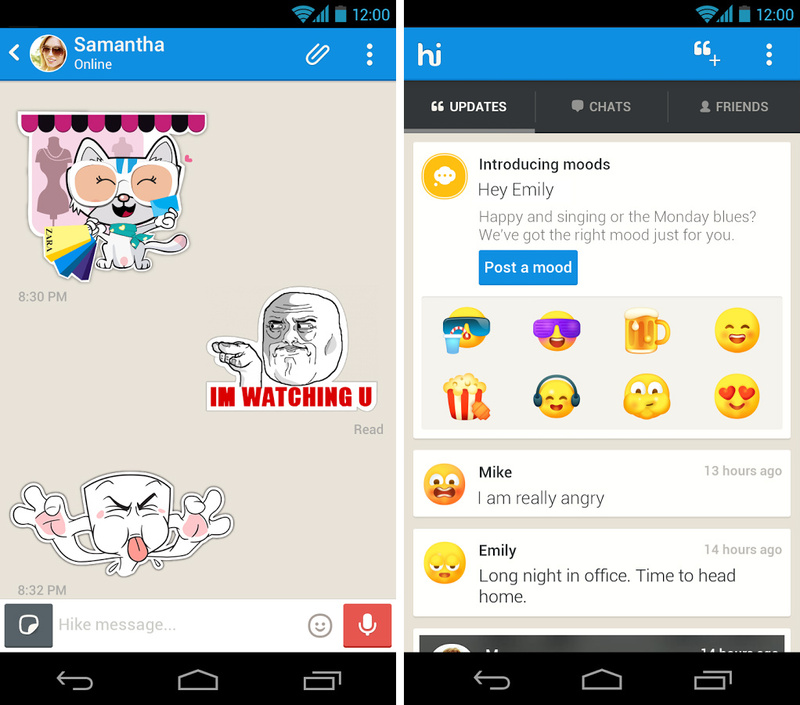 Verdict: Even Samsung users, who have the app pre-installed, tend to use other messaging apps. Voxer is a push-to-talk messenger app that, as well as regular text messages, allows you to send ‘walkie talkie’ like voice messages to individuals or groups. Messages are streamed live but can also be played back later. 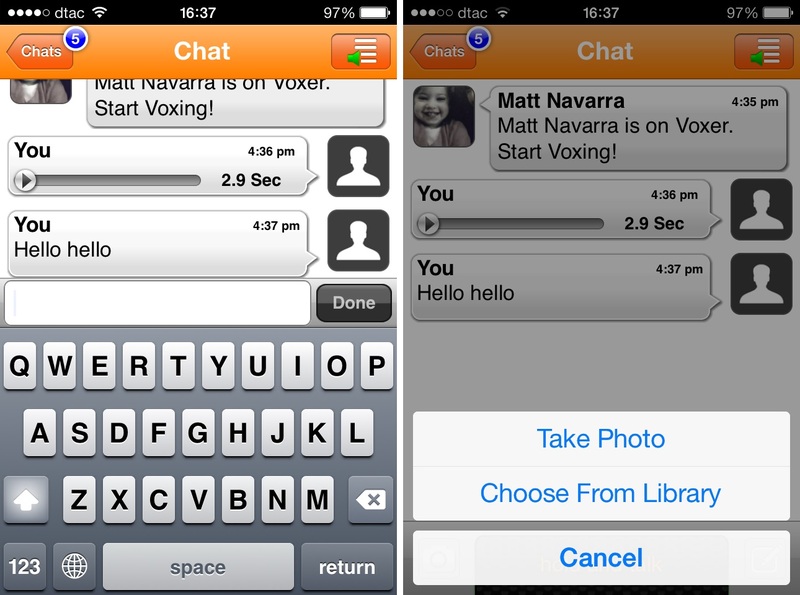 Besides audio messages, Voxer also allows you to send text and photos and share your locations in chats. The app has a paid business version to cater to company communication and includes features such as company-managed user accounts and full administrative access over communications. Pros: The strong focus on audio messages sets it apart from other messenger apps. Cons: No video chat, and the free version of the app includes fewer features. Verdict: Useful app for those who rely on audio communication, particularly business users. Over to you: Did we miss an app from our list? 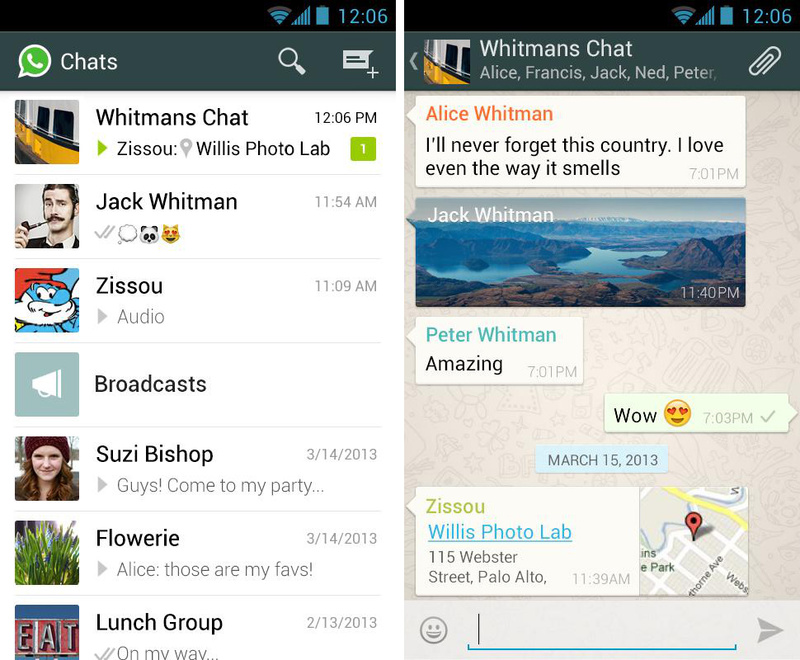 Which chat messaging app is your favorite, and why? Shanna Tan contributed to this article.